Tallahassee, Fla. – The Florida State University Athletics Department and the FSU Police are announcing a clear bag policy for all athletic events beginning with the first home competitions of the 2016 season including the football opener September 10 against Charleston Southern. 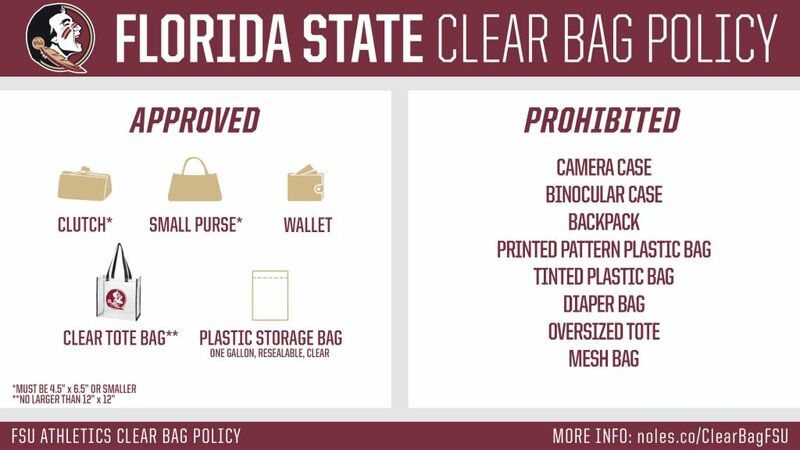 The new clear bag policy will provide a safer environment at home events and should significantly expedite fan entry into FSU athletic venues including Doak Campbell Stadium. The new policy closely matches those already in place at all NFL stadiums, including the two FSU will visit in 2016 and at Camping World Stadium where FSU will open the football season against Ole Miss September 5. In addition, the policy is similar to clear bag policies recently announced by 2016 opponents Clemson and Florida. Small clutch bags no larger than 4.5” x 6.5”, or approximately the size of a hand, with or without a strap are allowed. · Medically necessary items that are too large to fit into a clear bag within allowable dimensions can be brought in only after clearing a screening process at GATE C.
The clear bag policy has been adopted to allow for a safer environment at Florida State home events and in keeping with increased security practices being implemented at venues around the country. Are other athletic venues limiting bags? Is this policy only for FSU football games at Doak Campbell Stadium? How does the new policy improve public safety? Will Florida State make money from the clear bag policy? Can smart phones, tablets, binoculars or cameras be carried SEPARATELY from what they put in the clear bag? Are seat cushions, seat back chairs still allowed? What happens if a fan shows up at the gate with a bag that is not permitted? Yes. In fact, there are a number of college venues that do not permit bags of any kind to enter their stadium. NFL stadiums, like FSU fans will visit for the USF and Miami games and bowl venues like Camping World Stadium which will host the Ole Miss game, have similar clear bag policies plus pat downs and metal detector screenings. The limitations on bag size and style is a further enhancement for convenience and safety. No. This policy will be in effect beginning in August 2016 at ALL FSU Athletics events, regardless of sport. The clear bag is easily and quickly searched and greatly reduces faulty bag searches. It also supports the Department of Homeland Security’s “If You See Something. Say Something” campaign. How is the new policy more convenient for fans? The clear bags will enable security to move fans through check points much faster than in the past. A standard size bag eliminates the need for bag templates to check bag sizes. Clear bags will allow staff to be more efficient and effective in keeping you safe by preventing dangerous items from entering the stadium. Will Florida State be making money from selling team identified bags to fans? No. A variety of options exist that fans can use including any clear 12” x 6” x 12” bag, which is approximately the size of a common, one-gallon, Ziploc storage bag, which is also a permissible option. In addition, fans may carry in their own small clutches. A number of vendors currently offer approved clear bags for sale with logos and handles, but those are optional for fans. One large clear bag – either a one-gallon Ziploc style bag or the 12” x 6” x 12” clear bag – plus a small clutch. The larger clear bag must be a standard 12” x 6” x 12” made of CLEAR PVC vinyl and visually searchable. The small clutch allows privacy for small personal items and is also easily searched. Yes. Phones, cameras or binoculars can be carried in by hand. So, these items remain okay to bring into the stadium. Yes. These are allowed under same size restrictions as previous seasons. Fans will not be allowed to enter a venue with a non-conforming bag. Fans will be asked to return items to their vehicle. It should be noted that vendors on Langford Green (south end of stadium) will have clear bags available for purchase. No. Unlike some venues, Florida State is not banning all bags. Small clutch purses, with or without a handle or strap, are permitted along with either the 12” x 6” x 12” clear bag or the one-gallon Ziploc bag. This should allow you to carry the same items you have for previous FSU home events. We encourage fans not to bring any bags, but have implemented a policy that balances fan needs with improved public safety and convenience. Diapers must be carried in a clear bag. Each member of a family, including children, would be allowed to carry an approved clear bag and a clutch purse into the stadium. That is quite a bit of storage capacity. An exception will be made for medical necessary items after proper inspection at a specified gate. In the case of Doak Campbell Stadium, these items must be cleared at GATE C.